It was 30 years ago this summer….. 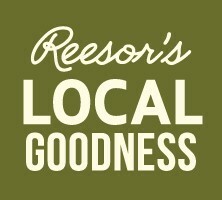 It was 30 years ago this summer that we first opened up Reesor Farm Market on the 9th Line. Although our current building is quite basic, our original market was just a farm wagon with a canvas roof. Over the years the variety of produce, baking and foods that we offer has increased along with our customer base. As time passed and to make life better for everybody we built a little market building. Every few years we’ve added some new features and the farm market grew to include a bakery, coolers and more fresh and local food. This week I was glad to welcome my parents (in the photo above) to opening day of our farm market season. Both my dad and my mom physically helped to build the market and have been a tremendous support to me in running the farm and the market. My wife Miriam also makes huge contributions as well. It has taken a lot of work over the years to build our business and she has always been supportive. I am hoping for a good season for all of us this year growing and making good food.